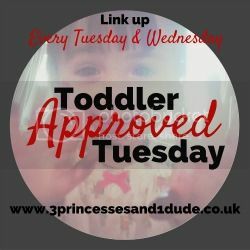 Welcome to another Toddler Approved Tuesday linky. There was so many great posts shared last week and I loved my first week as co-host with Becky over at 3 Princesses and 1 dude! We had a playdate this week and the girls had great fun with this Creative Art Collage and spent ages creating this masterpiece that’s on display on or wall. And look at this amazing Edible Nutella Playdough from my co-host 3 Princesses and 1 Dude. YUM! My two favourites from last week are from Let them be small and Bring Mummy Coffee. Don’t forget to link up each Tuesday from 6am until 11:55pm on Wednesday and I’ll pick two favourites to showcase next week. I absolutely loved this Frog Life Cycle Tuff Spot by Sarah at Let them be small. Such a fun way to learn and don’t forget to check out her amazing butterfly one. I adore this cute DIY Foot Print Flower Pots from Bring Mummy Coffee, it would make a lovely gift. Can’t wait to see what you’ve all been up to this week! Share your post using #ToddlerApprovedTuesday on your social media and include me in your Tweets (@clarestots) for a Retweet. I will also pin as many as I can to the #ToddlerApprovedTuesday board on Pinterest.